With the 30 April deadline to register fast approaching, firms need to review their eligibility and start working on their application as soon as possible, or risk missing out. In light of this, we’ve provided a snapshot of the program and the eligibility requirements. 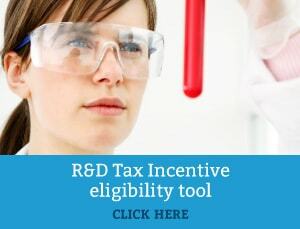 The research and development (R&D) tax incentive came into effect on 1st July 2011 and encourages companies to engage in R&D by providing a tax offset for eligible R&D activities. The program is administered jointly by AusIndustry (on behalf of Innovation Australia) and the ATO. For eligible entities with a turnover of less than $20 million pa the R&D tax incentive is a 43.5% refundable tax offset (equivalent to a 150% tax reduction). Must register the R&D activities each year with AusIndustry prior to making a claim for the R&D tax incentive in the company tax return (NB: Due April 30). Eligible R&D activities typically pertain to only R&D activities conducted in Australia. To be eligible for the R&D tax incentive the activities must be classified as either core R&D activities or supporting R&D activities. Supporting activities are activities that do not constitute core activities, but are directly related to core R&D activities. In short, core R&D activities are essentially the experimental undertakings conducted to generate new knowledge (The R&D Tax Incentive: Glossary of Frequently Used Terms). However, it is vital to note that activities must show that they are undertaken for the dominant purpose of supporting R&D activities or generating new knowledge, rather than a commercial or other purpose. To illustrate, Figure 1 shows the four parts of a systematic progression of new knowledge generation. As Figure 1 reveals, a core R&D activity will typically commence after a hypothesis has been developed. This is because the activities associated with developing a hypothesis are more likely to qualify as supporting R&D activities (for example, literature searches, background research, consultation with industry professionals, to thereby inform the design of a core (experimental) activity). In contrast, the activities undertaken to test the hypothesis are much more likely to be considered a core R&D activity. This includes the design and conduct of the expirement, observation and evaluation of results (what was observed, changed, discovered), and the drawing of logical conclusions. To make the process easier, we’ve put together an infographic which indicates the activities that do not qualify for the R&D Tax Incentive. You can download the PDF to print or save here: Examples of Non Core R&D Activities. In a previous blog post, we delved into what is considered ineligible expenses and expenditure. If you think your company may be eligible, have a discussion with one our R&D tax specialists who will be able to answer any further questions or help you make your claim.